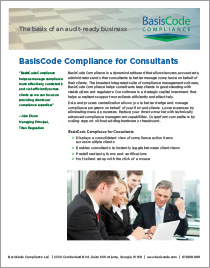 The BasisCode Dashboard provides centralized access to the tools you need to manage your firms’ compliance program, with a current snapshot of activities and/or tasks awaiting action or approvals. The role-sensitive BasisCode Dashboard helps supervisors monitor team member activities to ensure timely completion of compliance tasks. Compliance officers can view their individual calendars of applicable tasks, tests, certifications, personal trading testing, and risk assessments for which they are personally responsible. Exceptions, which are processing discrepancies that need remediation, are indicated with severity, financial impact, and the resolution process is tracked with each exception review. Executives can be notified when an exception is added and can be easily viewed within the BasisCode Dashboard. Flexible and interactive query, filter and data extraction capabilities allow for robust reporting with access to any review or test, open or closed, by due date or period under review. Detail and summary reports can be created for any time range specified. 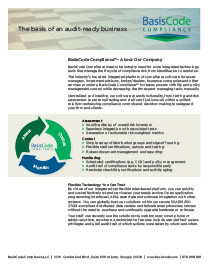 Reports can be printed or exported to several common formats including Word, Excel, and PDF. Access to review data is on a need to know basis. Permissions are user and role based to ensure separation of duties. 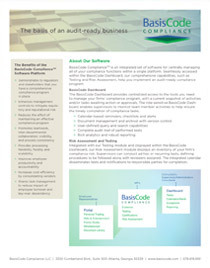 Exceptions Report – Provides transparency and ability to notify executives as exceptions are added. Violations Report – Allows users to report on exceptions, gift and entertainment (GEM), personal trading, and forms submitted for a given date range. Analytical Report – Summarizes the number of times tests have encountered exceptions and percentage of on-time completion for a date, to demonstrate effectiveness or the need to modify procedures and frequencies. Activity Report – Allows users to report what compliance activities have changed during a given period of time by compliance officer. Summary Report – Provides periodic summaries or compliance program updates that can be automatically emailed to executives.